Training, when & where you want it! For some organisations, the ideal training solution is a bespoke In-House course and with IASeminars In-House service, you get exactly the learning you need, precisely when and where you want it. Read on to discover why IASeminars In-House Training service offers you significant advantages. Focus on your own company rather than generic examples, and maximize impact by incorporating presentations from your auditors or company management. Run the training where and when you want it – at your own premises or at another suitable venue of your choice - anywhere in the world. Receive first class support and advice from our dedicated team from planning to delivery and de-brief. 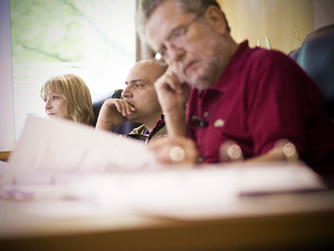 Work with the IASeminars instructor best qualified for your organization and your business sector. Our in-house courses qualify for professional education training credits (PD, CPD, CPE) from institutes around the world. Our cost effective In-House courses are priced per day with no limit to the number of participants. If you choose to train locally, you will save on course fees, travel expenses and time away from the office. Every In-House Training session is different - we customize the training and that applies to the pricing too. Tell us about your project, and we will give you a specific training proposal and price according to your training needs. The price will be based on a per day (rather than per person) basis, and we place no limit on the number of participants. Read on for a selection of our most recent client testimonials or click here to view all. This seminar was well organised, topically relevant to an actual situation at the institution. [The instructor] is excellent at taking a complex topic into a diverse audience where all participants feel they have gained value and enjoyed the learning. Very knowledgeable on the topic and able to impart the theories in a simple and understandable manner. Best IFRS 9 course I've attended. Very good, focused delivery and specific to our area of work. IASeminars consistently deliver high quality training. Would engage them again. Very informative and relevant to my day-to-day experience in governmental accounting. A great refresher course! Presenter showed excellent knowledge of the topics he presented. Very good seminar, brought back some areas that I have not focused on in my role. This is an invaluable avenue for training and development of professional skills. Perfect combination of theory, experience of instructor applied to cases of study, which provided me a great learning experience. General industry insights and case studies very interesting. [The instructor's] presentation was relevant, up-to-date and engaging. Excellent IFRS program with useful examples. The instructor has a great sense of humour. Combine that with IFRS, makes it fun. This seminar was very enlightening and totally exceeded any expectations as examples delved into the nuts and bolts of journal entry recording. [The instructor] was very knowledgeable with both US GAAP and IFRS and provided clear and precise explanations to our various questions. Excellent presenter who made some very boring subject matter very interesting. Innovative and engaging overview of technical accounting. Instructor is very knowledgeable. Gives good presentations and knows how to keep this audience's interest with questions and jokes. [The instructor] has a great sense of humour and assesses early at start of course which topics best interest the attendees. Great course providing clear and concise information. [The instructor] is very knowledgeable and keeps it interesting. A very good instructor made subject matter easier to go through. The only IFRS/GAAP update you will need - easy to digest and identify which changes apply to your organization. Speaker is very enthusiastic and knowledgeable. Very engaging, learnt a lot! The training section was very intensive. Beside it took only 2 days, a lot of information and discussion were come up. A lot of things to think and do deeper in each IFRS matter. It was very clarifying and helpful. Talk about real examples in Latin America was a good experience. Very good teaching seminar, good information and presenter was updated in the material. Practical discussions relevant to the business. Overall an enlightening course most suitable for financial staff especially in the oil and gas industry. The course was very detailed. The materials and facilitator were excellent. Strongly recommended for those who wish to be fully understand IFRS (both accountants and non-accountants). The training has improved my knowledge in the areas covered. The topics are relevant and were handled and delivered by a knowledgeable, competent and experienced [instructor]. Very good course for all finance / oil and gas professionals. The course is comprehensive and very rich in content. Sounds and knowledge, highly professional. I am quite impressed with the material and the instructor. All work together for better result achieved. The tutorial was detailed and well explained. The incorporation of questions made it very practical and helped with understanding the topics. Excellent, engaging and every year I learn something! Practical and relevant discussion to real issues we're facing from the roll out of these new standards. Very comprehensive and effective, gives good guidance specific to company. The course was excellent and was tailored to focus on specific IFRS issues in our industry and that we will meet day to day. [The instructor] is extremely knowledgeable and communicates clearly. Topics and examples are current and on point. This Leases deep dive was really good, thorough! I learned a great deal on the new revenue recognition. The seminar was very organised and informative. Seminar provided practical examples and examples specifically for [the client], which helps with understanding IFRS 15 and 16. Very good course, and training well structured. Presenter very knowledgeable and able to answer complex questions. Very informative training. Well-structured in terms of format and content. The training was well presented and relevant. I will certainly make use of your services in future. Training very tailored and specific for our needs, thank you. Good knowledge on the subject. [The instructor] delivered an interesting, light-hearted session on lease accounting. Everyone left with much more confidence about implementing the new standards. Great trainer, excellent knowledge, adapted to our company needs. Would highly recommend. Was a great training because applied to our business. Was particularly helpful to get calls in advance to determine the needs and the fit of the training to our current situation.